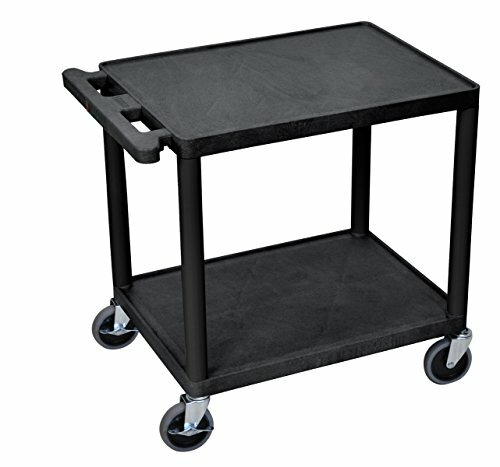 Offex LP Series presentation station AV carts are made of recycled high density polyethylene structural foam molded plastic shelves that will not scratch, dent, rust or stain. 400 Lb. weight capacity, evenly distributed throughout three shelves. Heavy duty 4" casters two with brake. 1/4" retaining lip around each shelf. This LP26E-B has 2 shelves 18"D x 24"W x 26"H. Includes 3 Outlet electric assembly with 15' cord and built in cord wrap in the handle. Electric: 3 Outlet 15ft Cord Included.